To get your KombiEngine ready, you now need the right KombiTools for your particular needs. 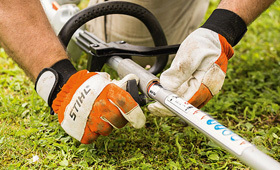 Choose from our twelve different STIHL KombiTools. Of course you can always buy more tools whenever you wish at a later date. Retrofitting is quick and easy with no tools required: loosen the tommy screw, swap the KombiTool, snap in the quick-release coupling, tighten the tommy screw and you’re done.